1. Heat oil in saucepan over medium heat. Add onion, and cook 5 minutes, or until soft. Add garlic and carrot, saute 3 minutes. Mix in peas and Sundried tomatoes, basil and spinach and vegetable stock Cook 5 minutes. 2. Place 1-cup dry quinoa with 2 cups of water into a medium saucepan. Bring to a boil, reduce heat to simmer and cover tightly until all water is absorbed. Do not stir. Fluff with fork and let cool. Gently fold vegetable mixture with cooled quinoa. 3. Preheat oven to 350°F. Pour can of diced tomatoes in bottom of baking dish. 4. Make an incision at the rounded top of each pepper, about 1 – 1-½ inches from the stem. Cut all around the stem in an even circle, and then pull out the stem and seeds. Fill each pepper with quinoa mixture to the top. Cover with foil, and bake 1 hour. Uncover and cook 30 more minutes or until pepper are starting to lightly brown and are soft to touch. Let stand 5 minutes. 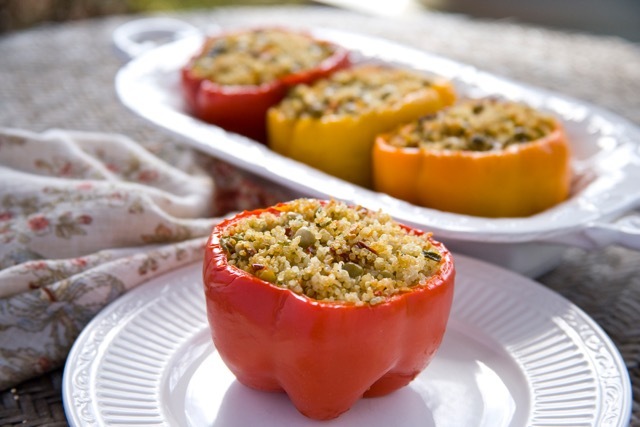 Transfer stuffed peppers to serving plates, and drizzle each with tomatoes from pan juices before serving. Sign Up for Recipes and Inspiration!